The plight of African children, including victims of poverty and those orphaned by war, disease and abandonment is commonly highlighted by the media and aid organisations. Focus on Africa is so high that equally disadvantaged children in more developed countries like Ukraine seem to have been abandoned and forgotten by their parents, governments, aid organizations and other stakeholders. A friend on Facebook shared a disturbing video that tells the story of Ukrainian children with disabilities abandoned by their parents, together with orphans in government-run institutions that have in tend, in my opinion, been abandoned by the Ukrainian government. The 2012 BBC documentary titled "Ukraine's Forgotten Children" is hard to watch. Ukraine ratified the Convention on the Rights of the Child (CRC) on 28 August 1991. The convention guarantees the basic rights of children, including the right to develop to the fullest and to protection from abuse and exploitation. The country is also party to the Convention on the Rights of Persons with Disabilities, which it ratified in 2010. 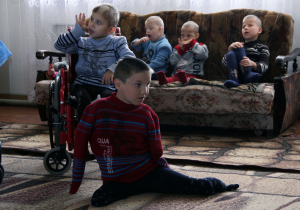 It is easy to conclude, after watching "Ukraine's forgotten Children", that the government of Ukraine has violated its legal obligations under international human rights law with regard to the rights of children and persons with disabilities. Orphaned children and those abandoned by their parents in state care have been left for dead in state institutions that do not conform with basic human rights standards in the areas of health, safety, in the number and suitability of staff, as well as competent supervision - as laid down in Article 3(3) of the CRC. According to the BBC, £9 billion was spent in Ukraine in preparation for hosting Uefa Euro 2012. It is unconscionable that children live under such deplorable conditions in state institutions, with inappropriate health care and staff to carter for their special needs. Common sense suggests that children with serious medical conditions should not be sent to institutions that lack trained medical staff. In my view, Ukraine's children in state institutions have been abandoned by both their government and the developed European community in general, including the media that focuses disproportionately on showcasing the plight of children in Africa and elsewhere. The media and European aid and development organisations are doing a great job putting the spotlight on (and protecting) children at risk in Africa, they should also highlight the plight of forgotten children in Europe, including orphans in Ukraine and discriminated Roma children scattered across Europe.